Carabiner water bottle holders feature a standard large carabiner clip with rubber o-ring for attaching to plastic water bottle necks. 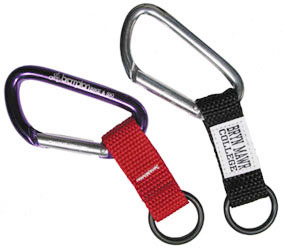 Both carabiner clips and straps can be assorted or a single color. Carabiner water bottle holders are available blank or custom laser engraved with your name, logo or message. Optional single-color custom printed label available. Carabiner water bottle holder accessories are also available separately. Imprint area: 2.0" x 0.20"
Engraving side two: Add $0.25 ea. Carabiner water bottle holders are Lowest Price Guaranteed! Custom printed water bottles available contact us for more information. -Colors can be assorted for price breaks. -Email for larger quantity pricing. -Blank carabiner water bottle holders are available. Our water bottle carabiners arrived today and our group loves them. The quality, your service and price is the best! We were also very impressed with your quick turn-around. I'll be in touch next year again for another order. Optional custom printed label: Add $0.45 ea. One-time label set-up charge: $45.